This home was built initially as a weekend house for a couple and their daughter. Later, at the onset of retirement, an addition was added which modified the house for full time living. 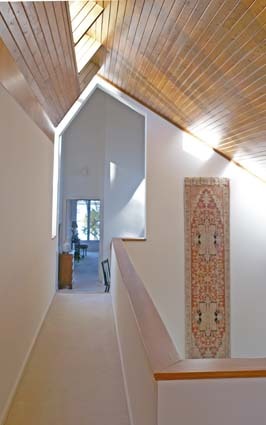 The living wing of the house has a continuous skylight running its length. The West sun as it sets lights the underside of the cedar ceilings. This is especially appealing during the cold winter months of the year. An open balcony, over the dining area and kitchen, looks over the living room and, through a skylight, out onto the water. The home is a featured project in the book "The Eastern Shore Chesapeake Gardens and Houses" and is an excellent example of how well traditional furniture can fit in and blend with contemporary architecture.